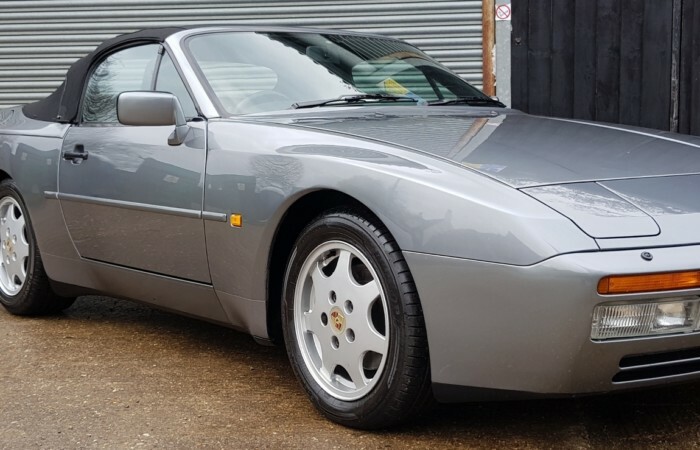 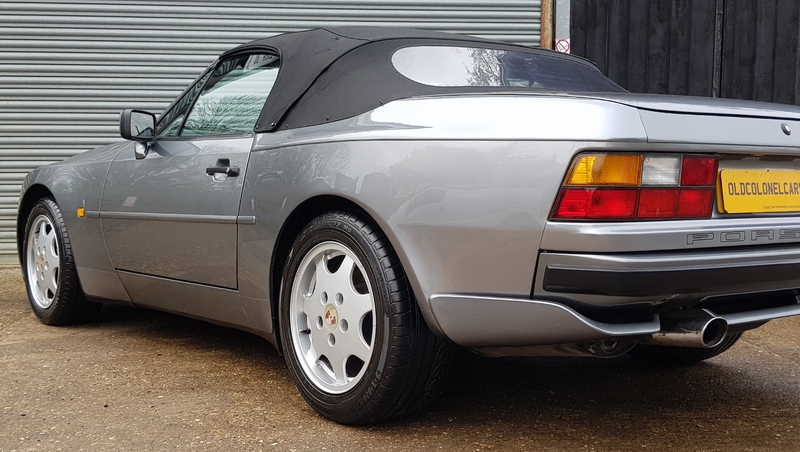 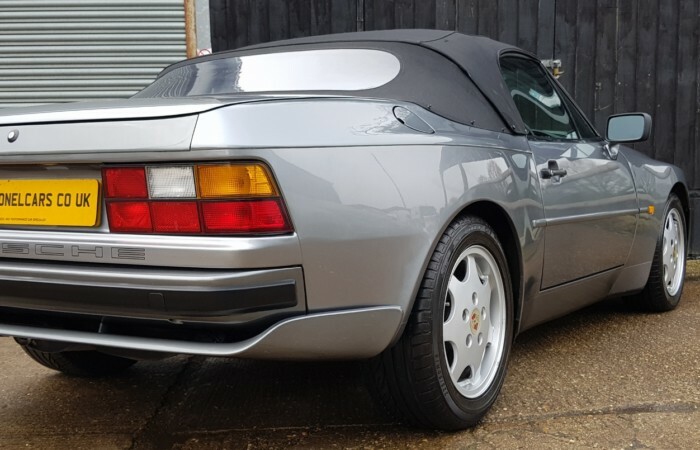 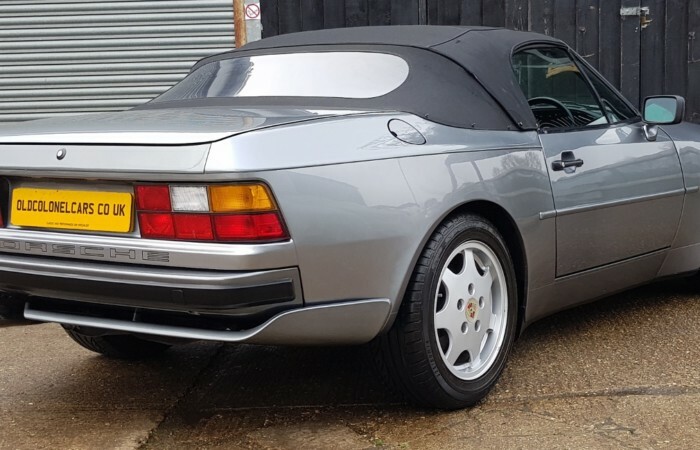 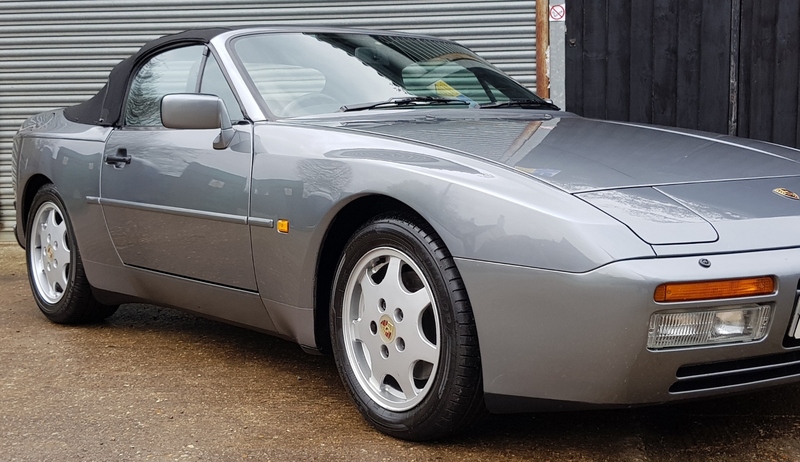 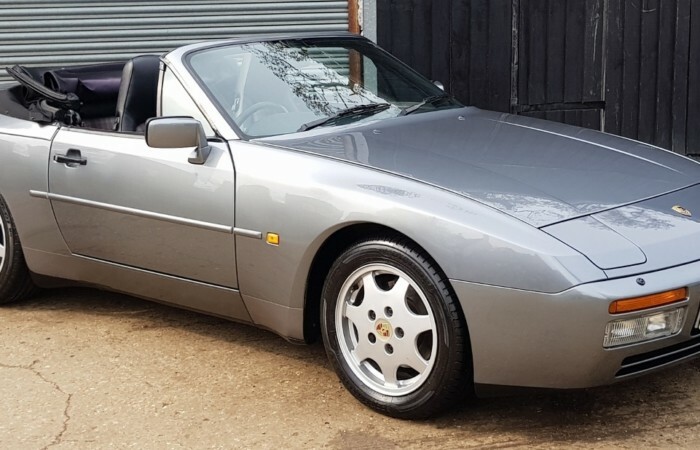 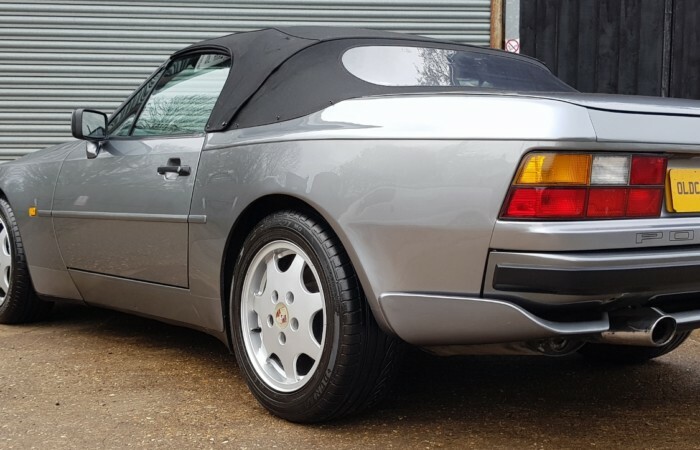 Here we have an outstanding example of the superb modern classic, the Porsche 944 3.0 S2 Cabrio. 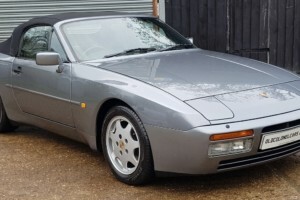 This May 1991 example has very low mileage, with only 74,000 Miles. 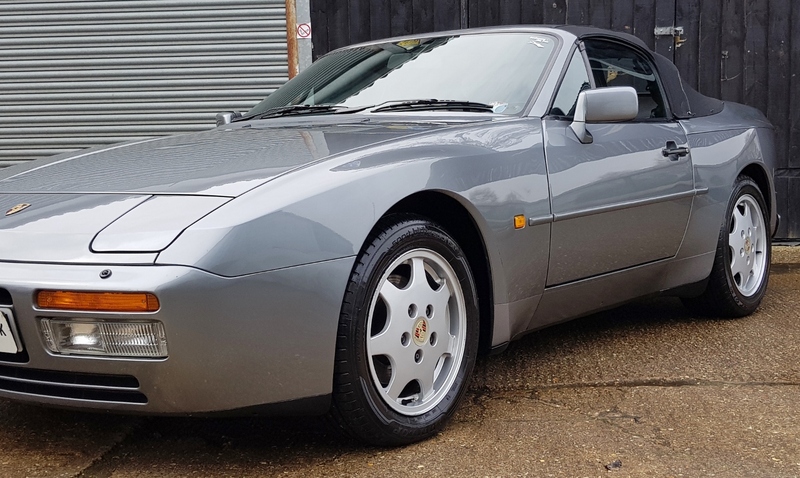 This 944 has always been perfectly maintained, you will not find a better cared for example. 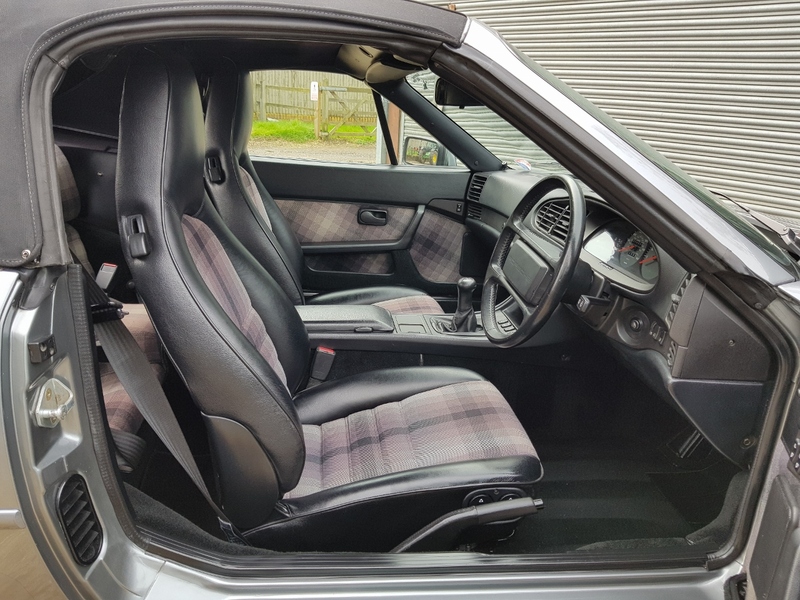 Owned for 15 years by a true S2 enthusiast. 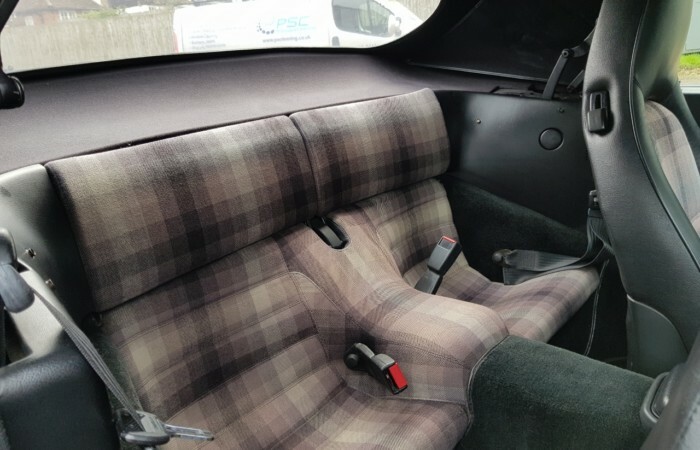 He looked at many examples back in 2005, as he wanted the very best available. 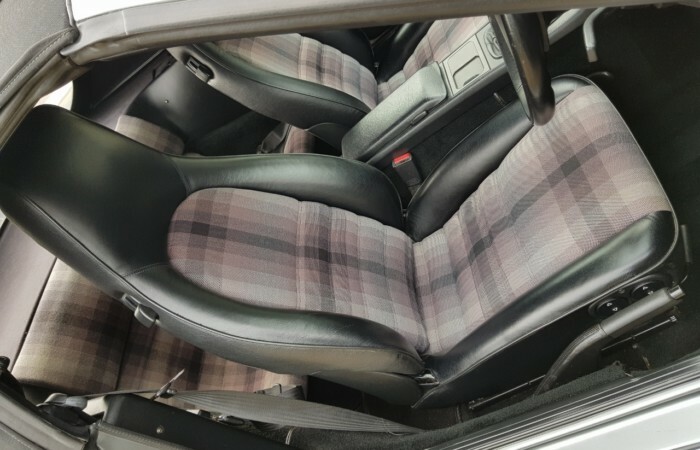 Finally, he found this example at a very well known Porsche specialist. 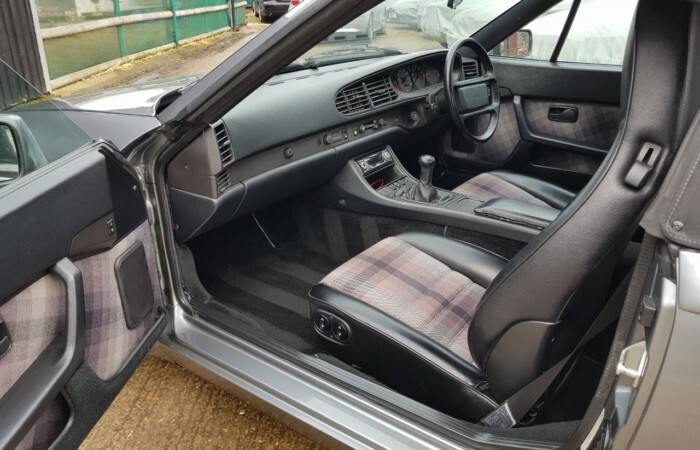 It was the most expensive example for sale at the time, but on close investigation, it was certainly worth paying the extra. 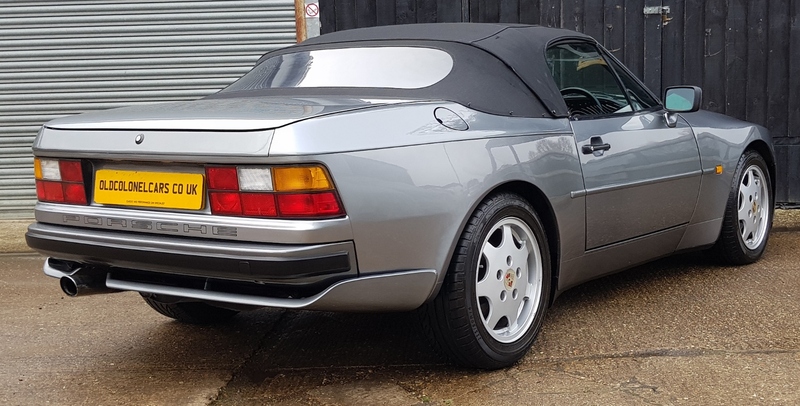 Since then, this car has been left in the hands of my local Porsche Specialist, Jaz Porsche, always with the instructions, do whatever is necessary. 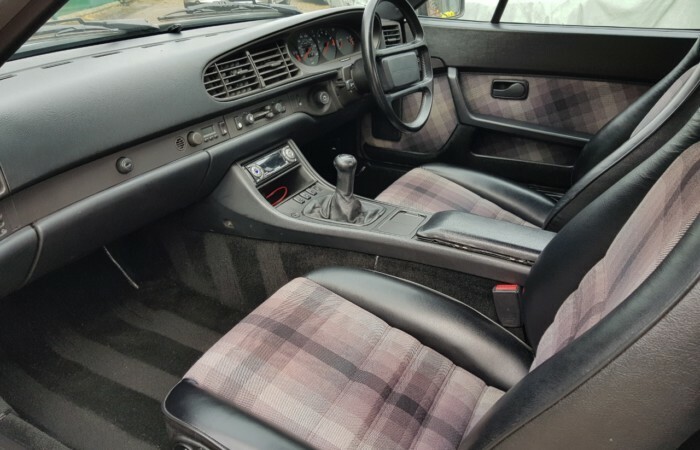 So, as you can imaging, this example drives and performs perfectly. 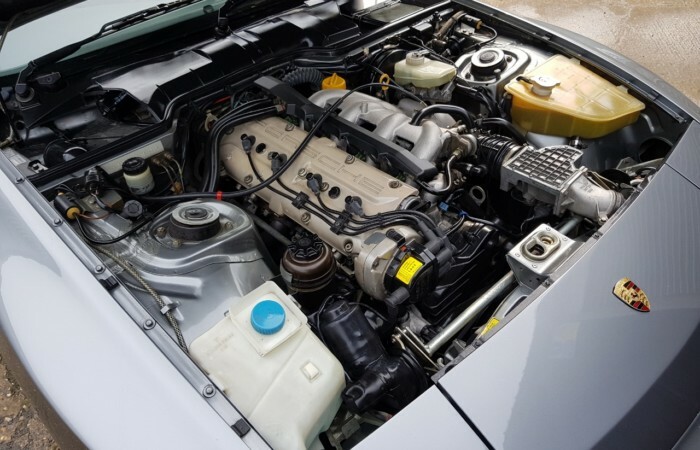 But look closer, look at the engine bay, look underneath this car, it’s in amazing condition. 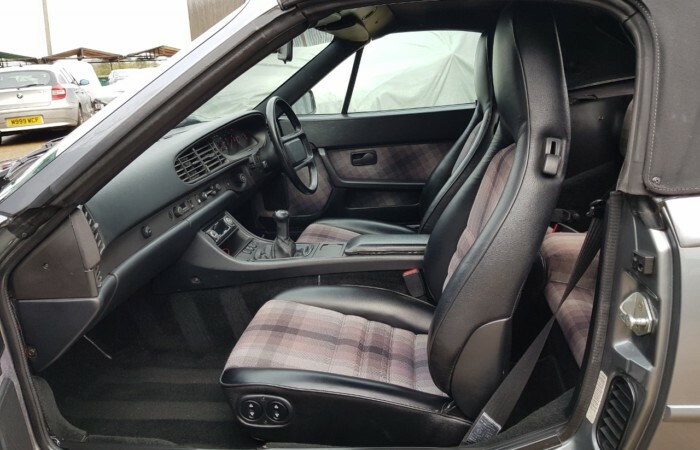 Good 944’s are now fast appreciating, the market is waking up to how well these were made and how much fun they are to drive. 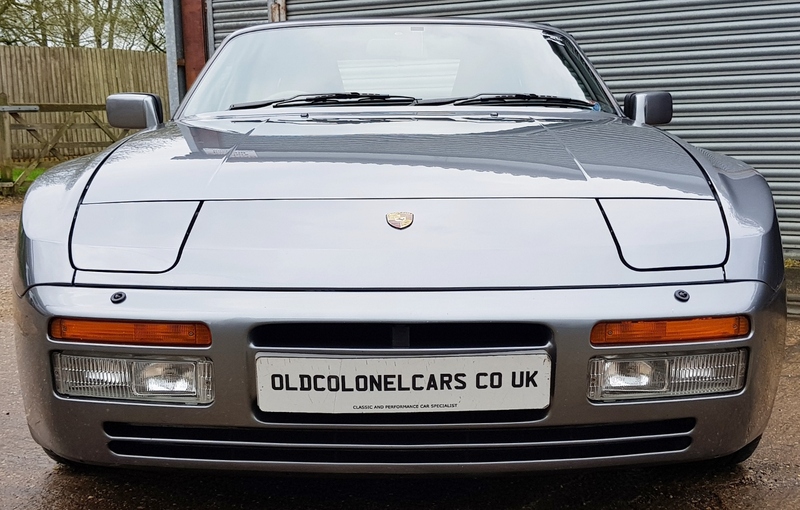 Featuring superb looks, with the ‘S2’ front end, rear valance shared with the Turbo model. 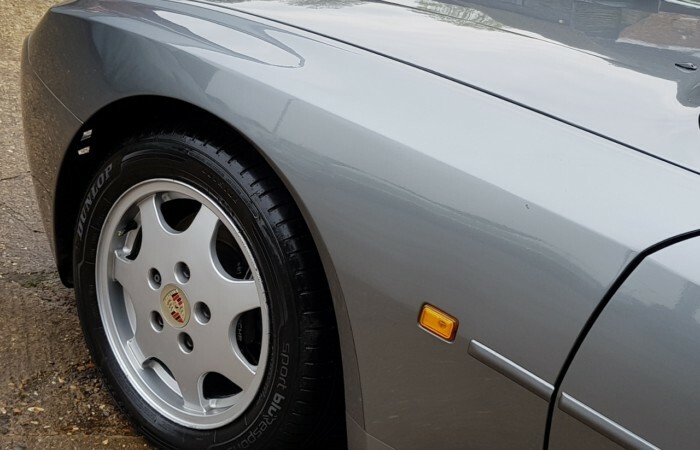 It features great handling, with its near 50 / 50 weight balance, a very responsive engine with lovely precise gear changes. 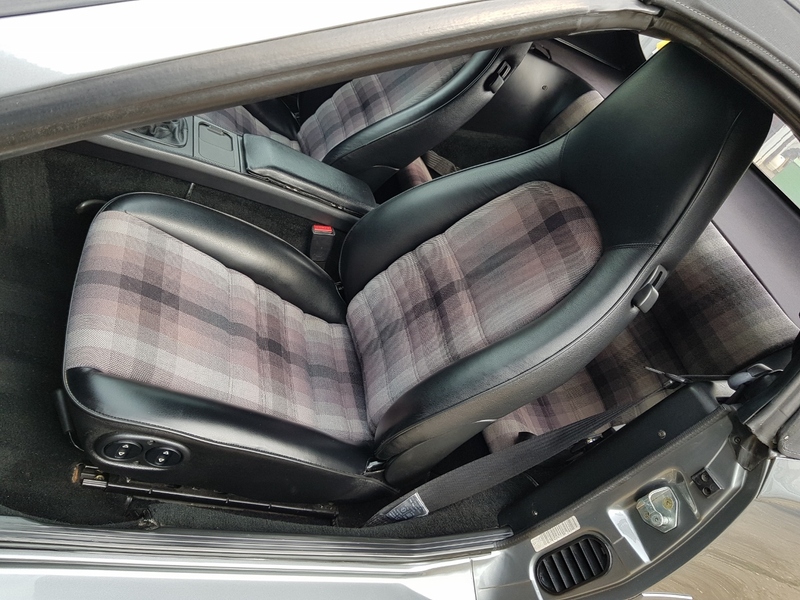 The low seating position, with the supportive sports seats, you feel really connected with this car. 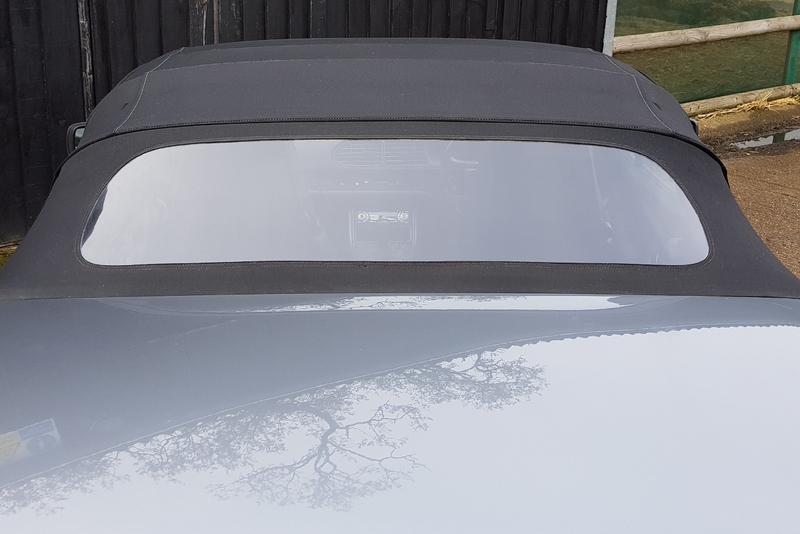 PAS, ABS, Electric seats, Electric windows, Electric mirrors, Electric roof, Remote central locking / Alarm, DAB Radio. 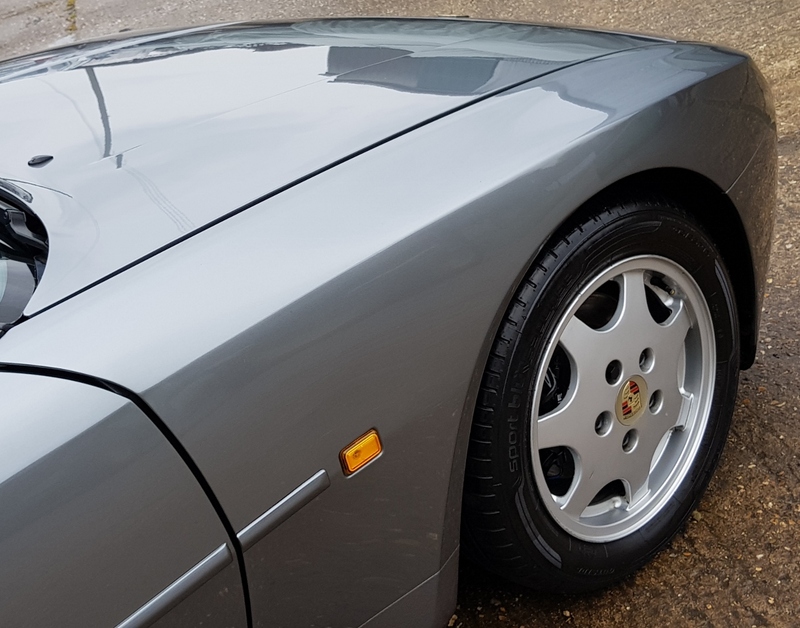 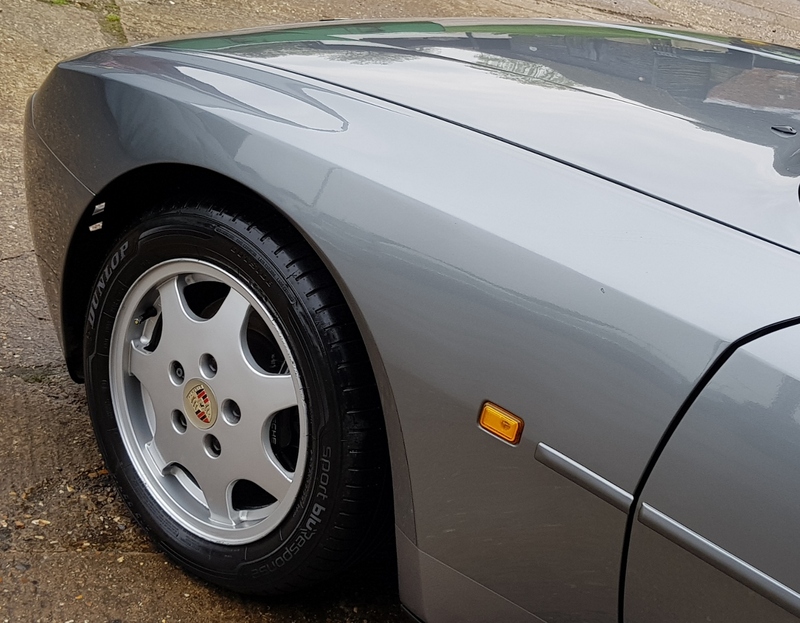 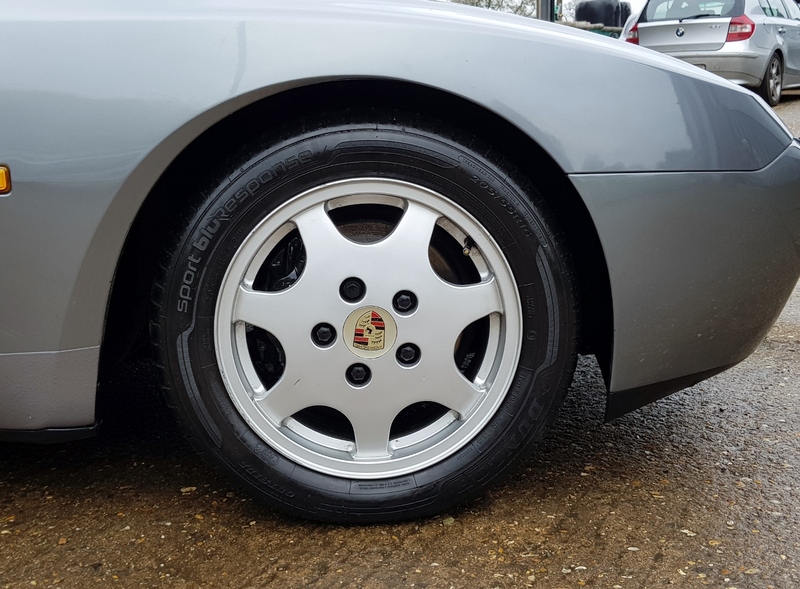 Finished in Titanium Metallic, a colour that really suits the 944 S2’s shape. 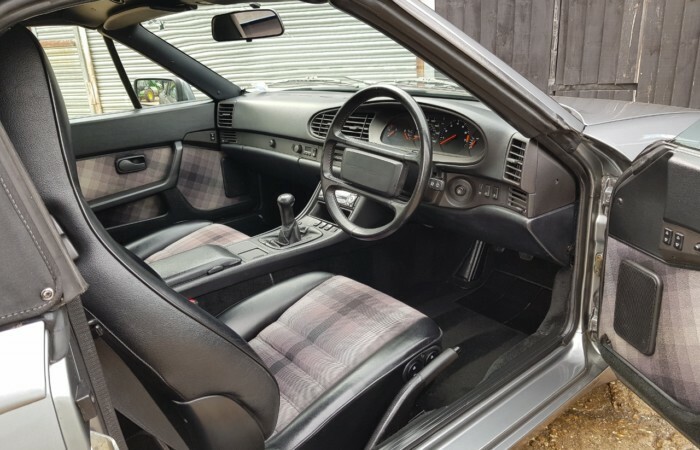 It’s in excellent condition. 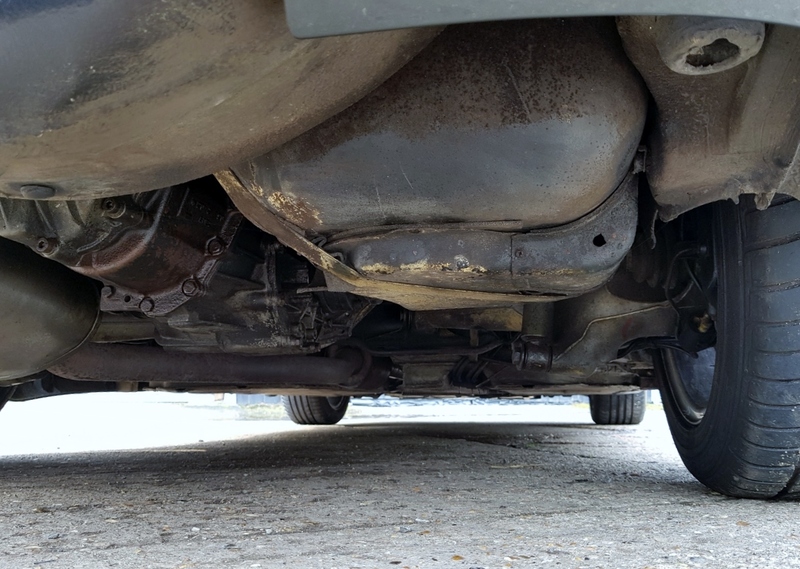 Look closer and you will see, all the arches etc, bottom of front wings are free from chips and the normal surface rust. 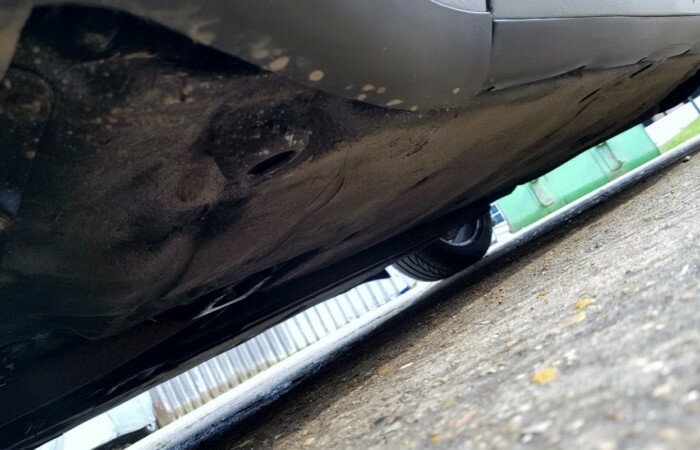 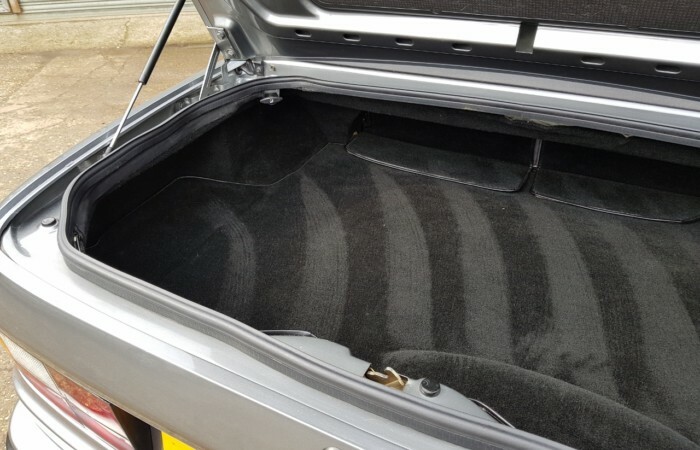 This car has been very much a dry day, weekend car and the condition shows. 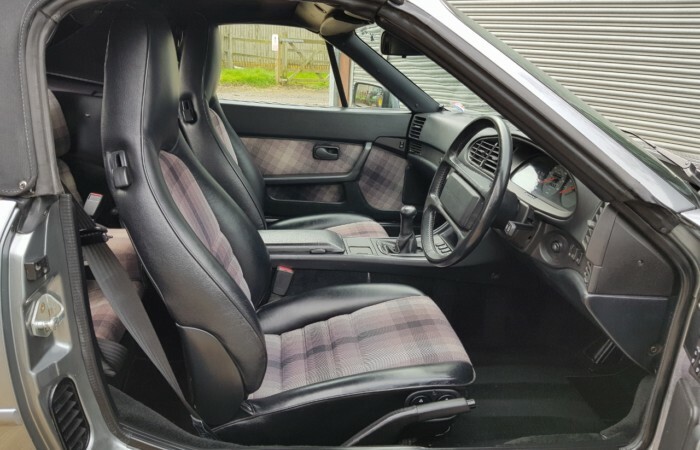 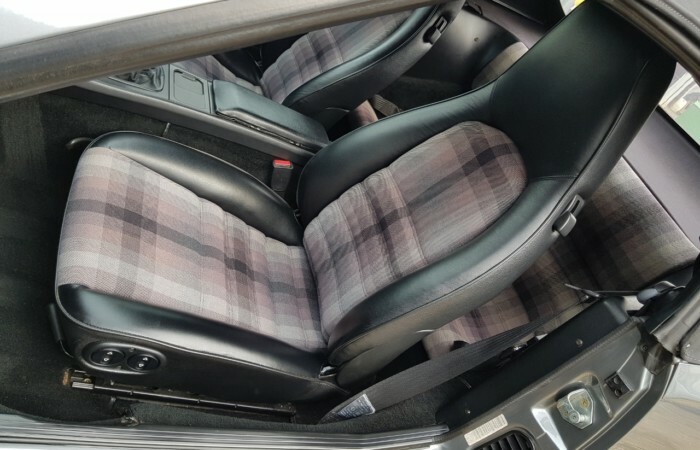 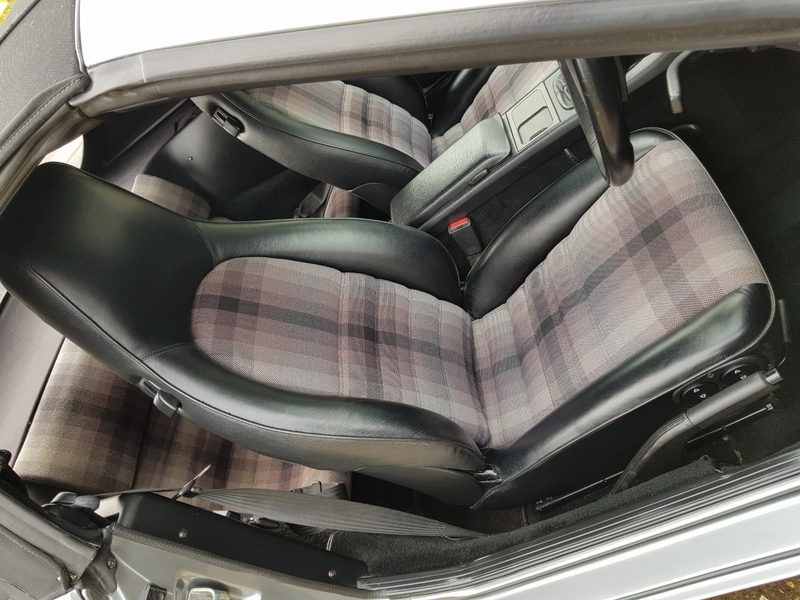 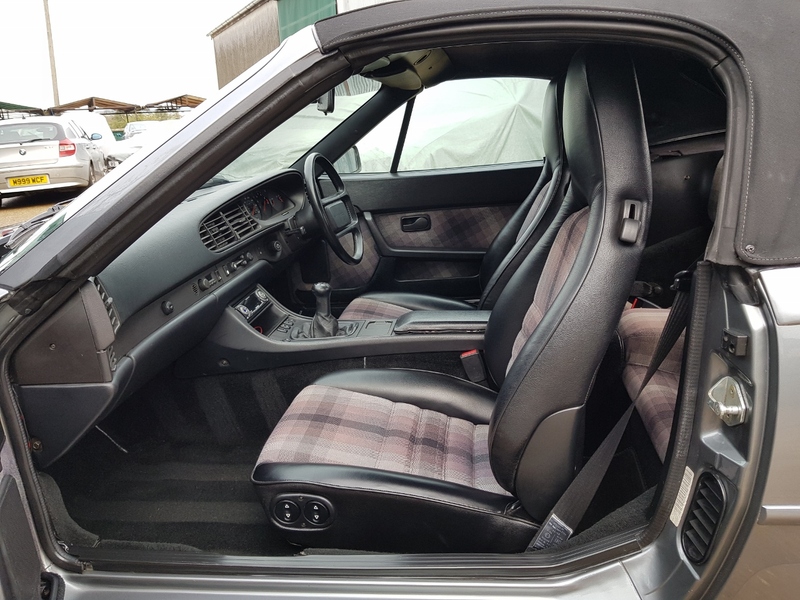 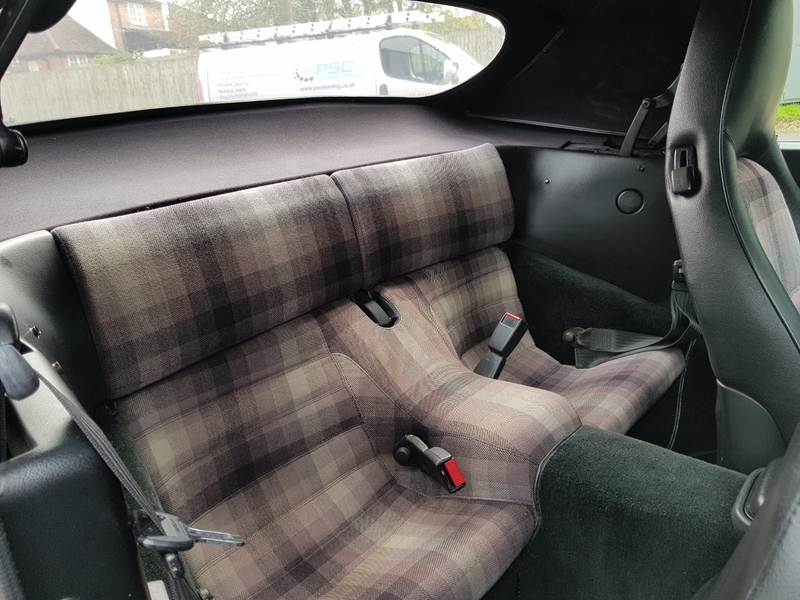 This example features a special order Plaid cloth interior with matching door cards. 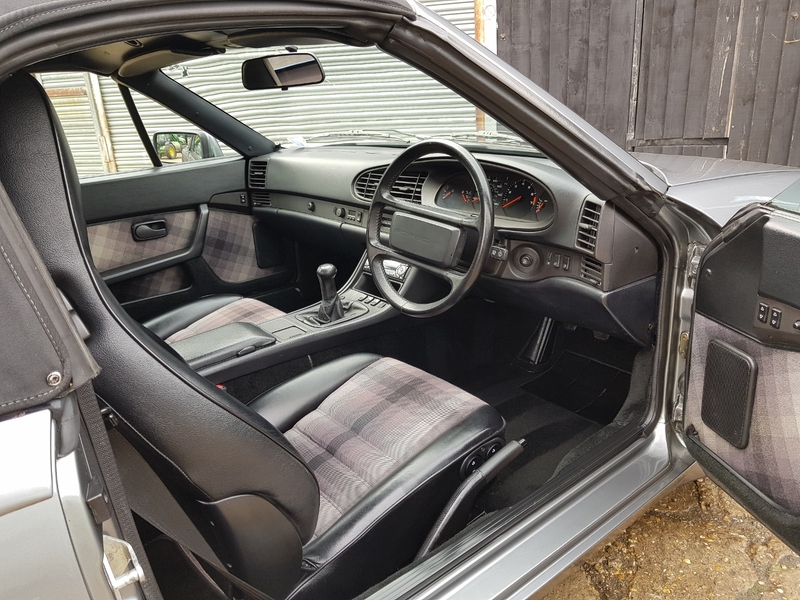 The condition must be seen to be believed, it truly is in unmarked condition, you will not find a better cared for interior, it’s amazing. 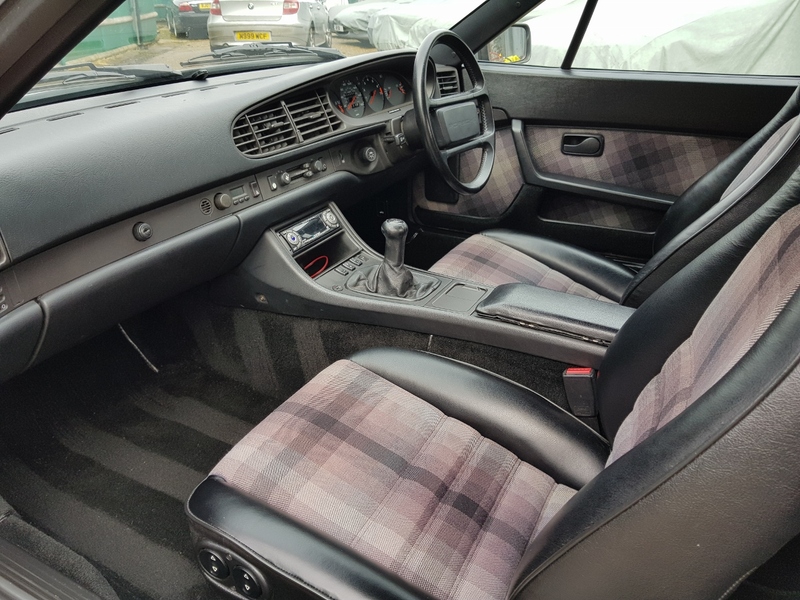 The colour scheme and pattern really feels right in this car, it certainly stands out at any show. 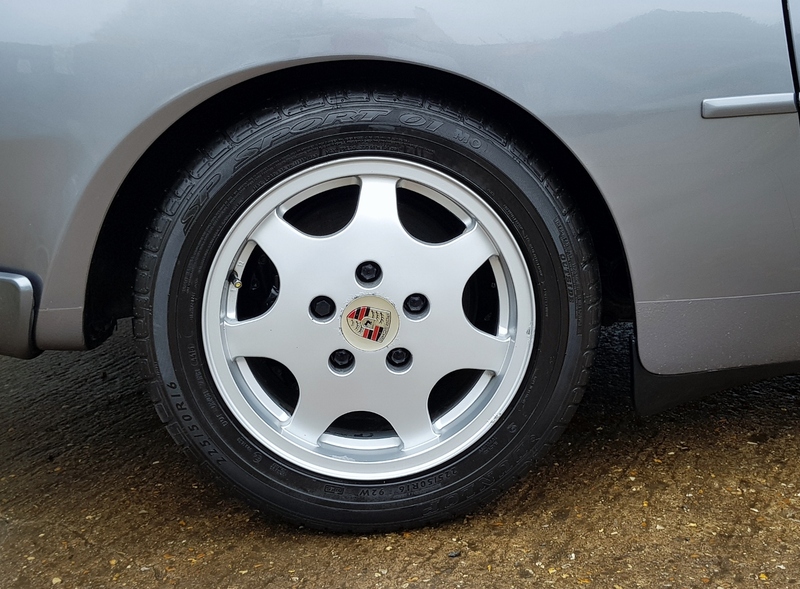 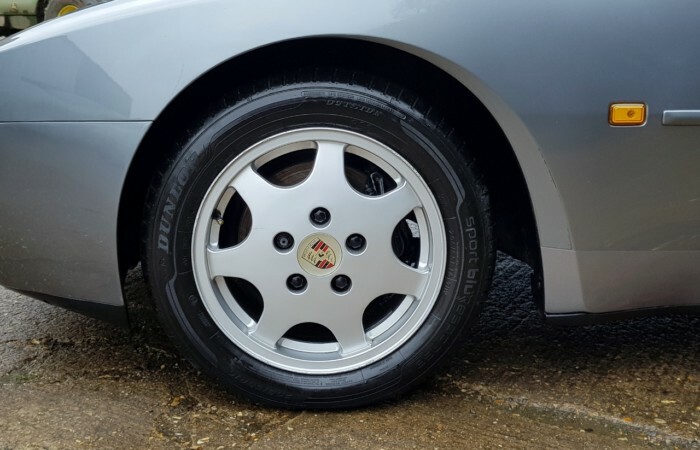 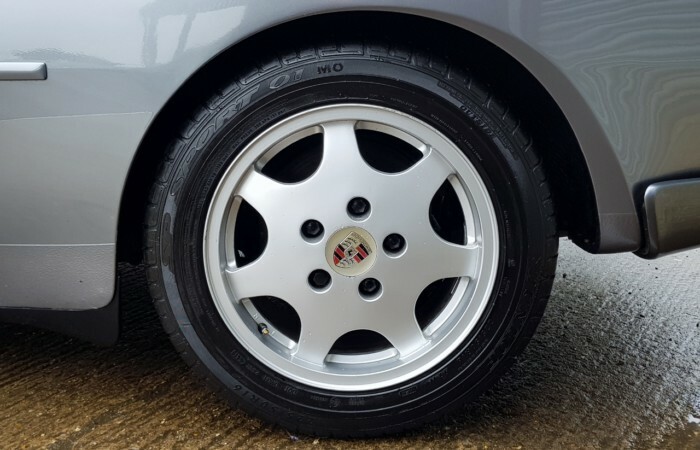 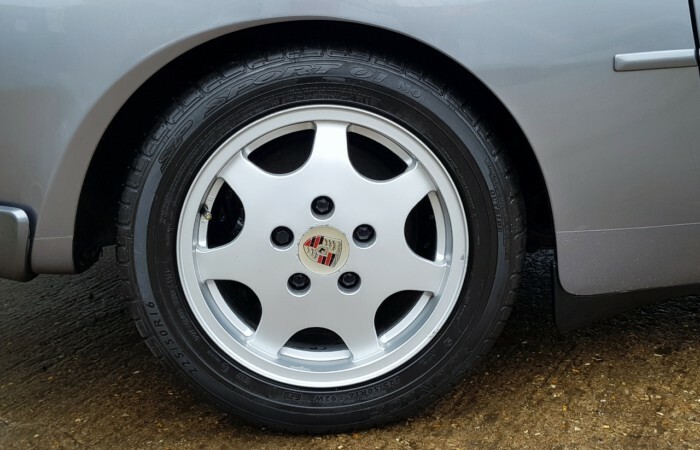 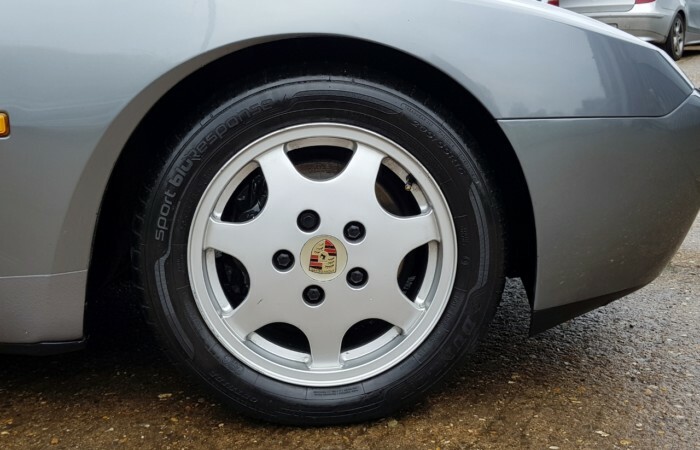 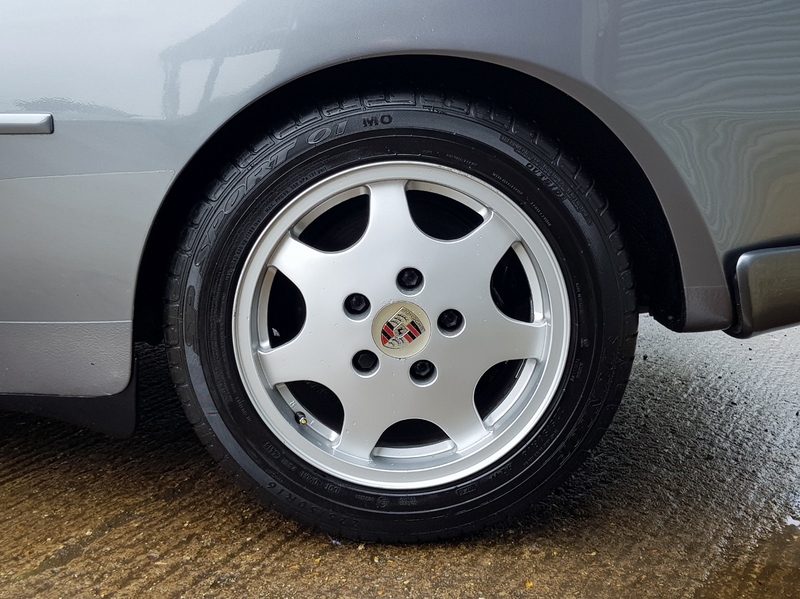 The S2 alloys are all in lovely condition, all fitted with nearly new, matching Dunlop tyres. 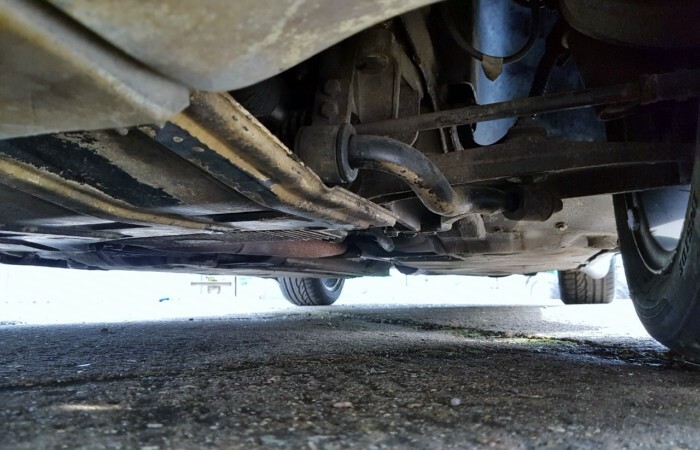 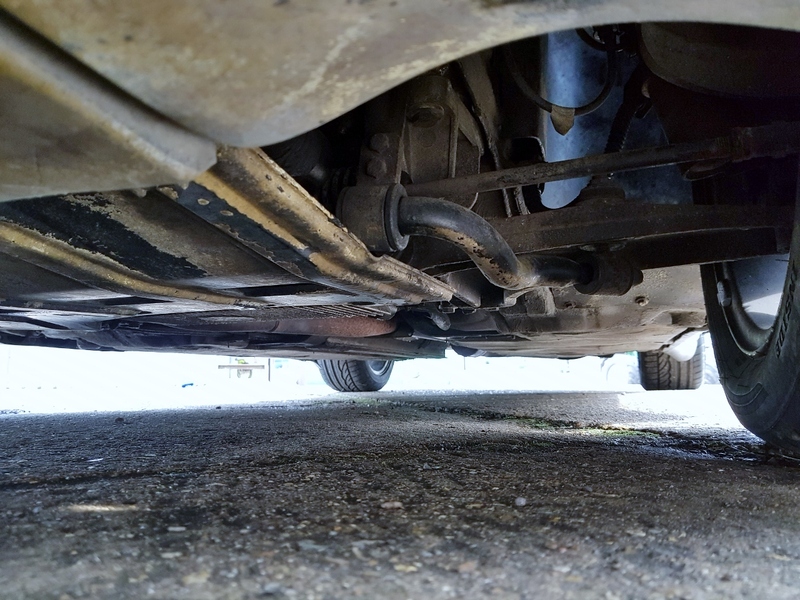 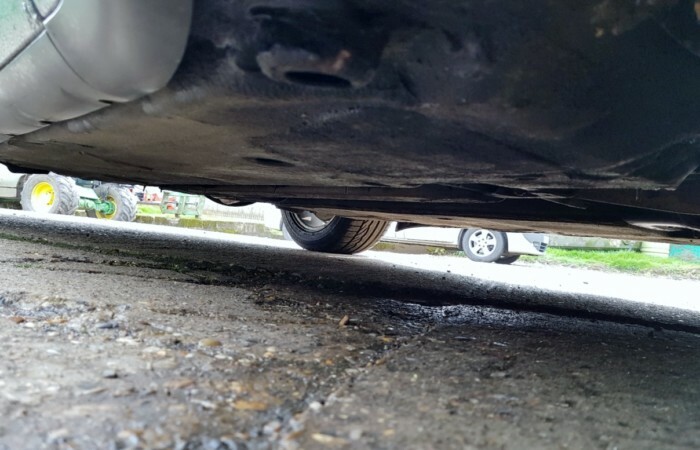 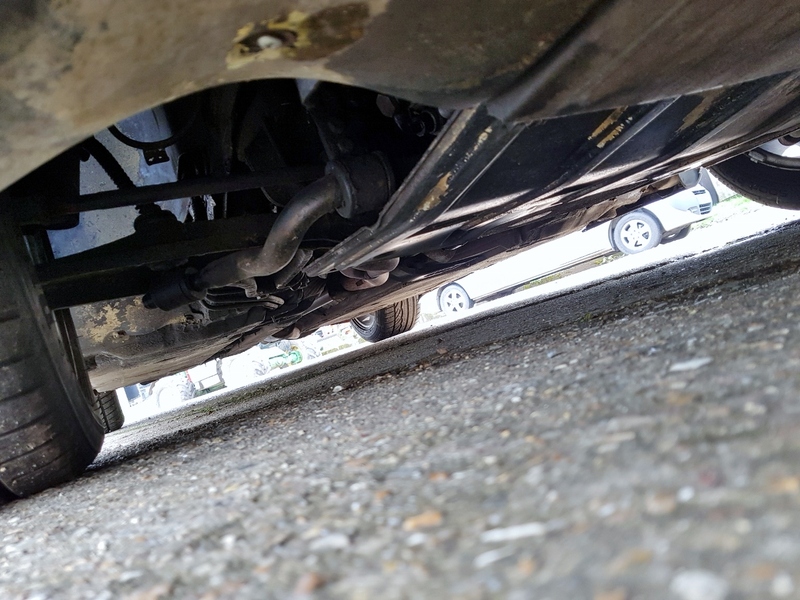 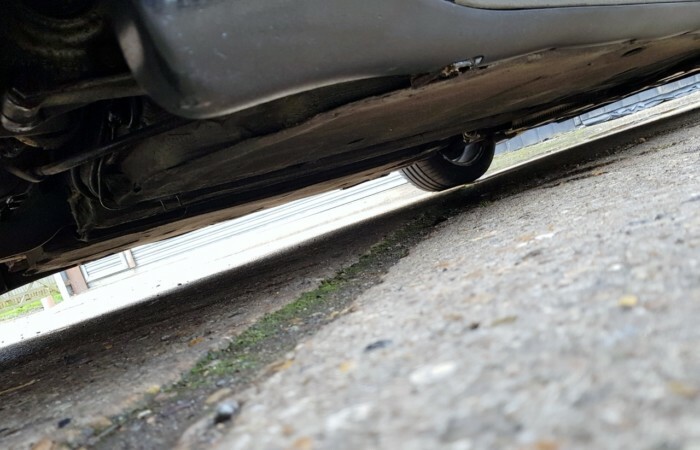 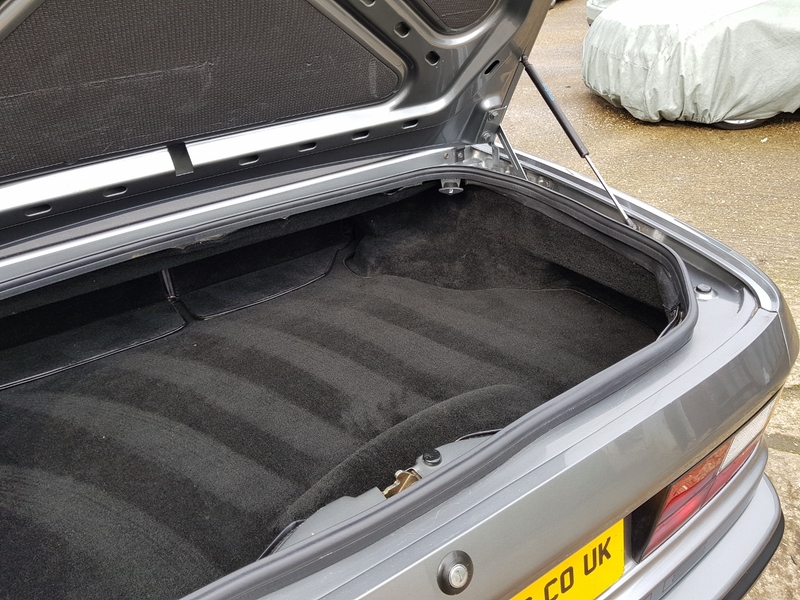 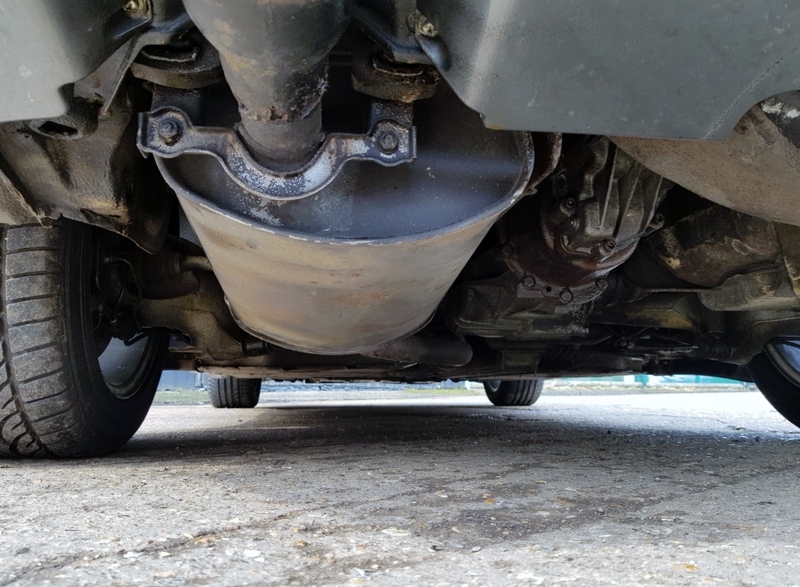 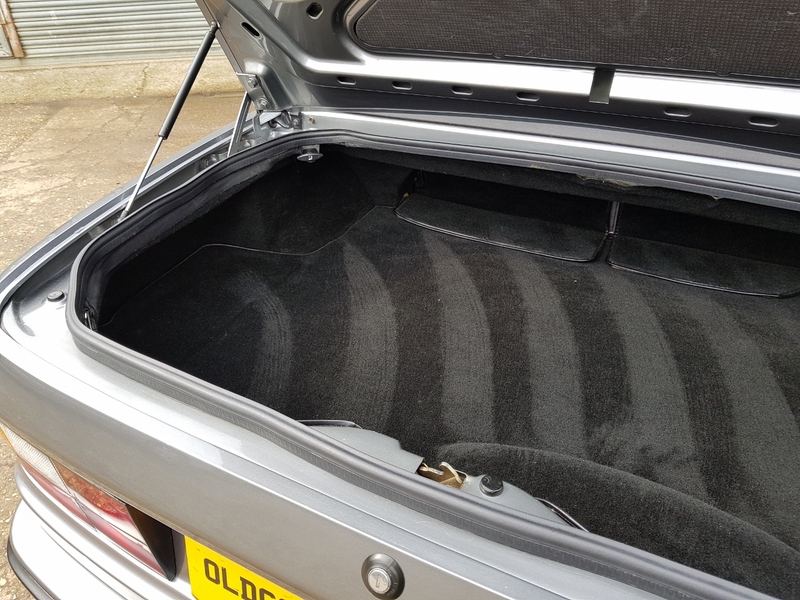 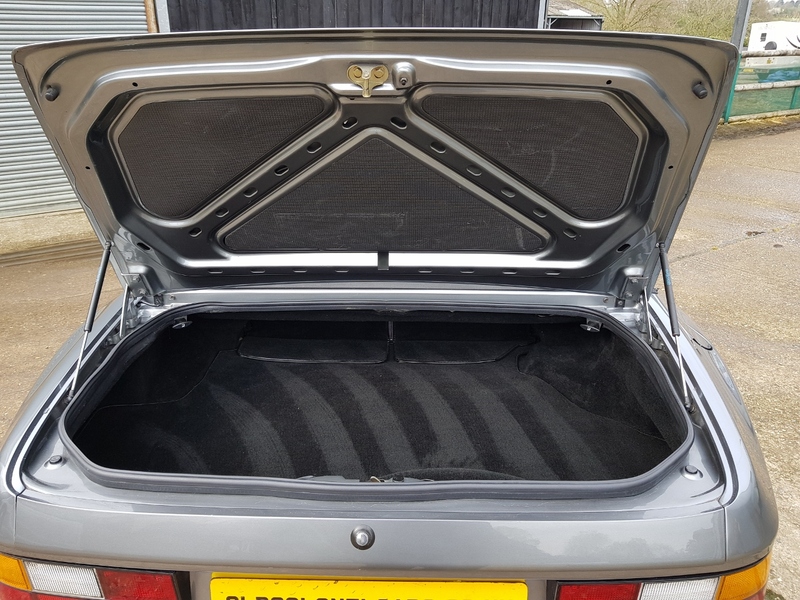 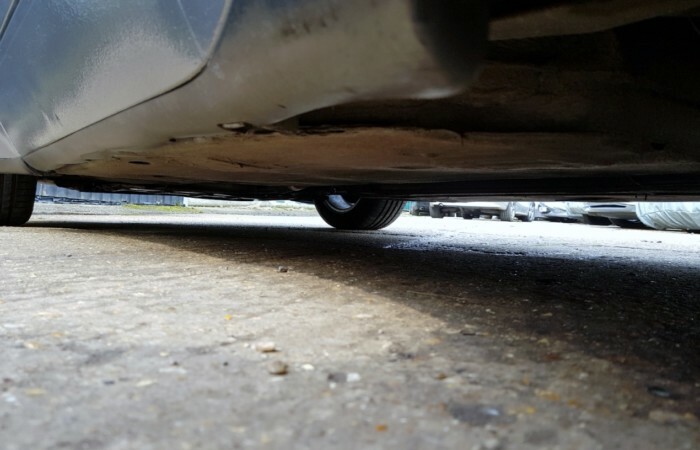 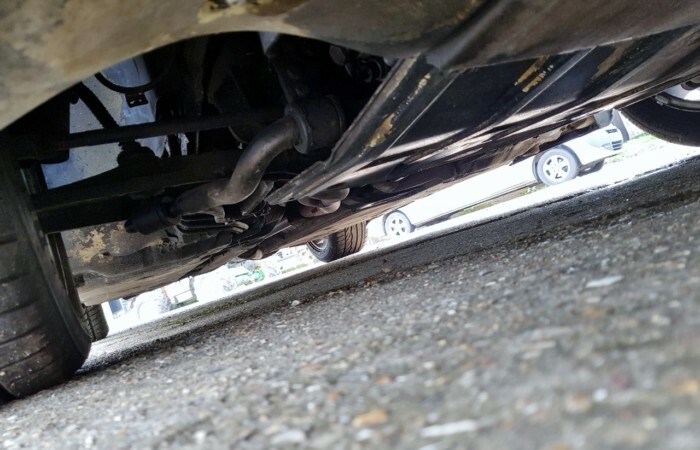 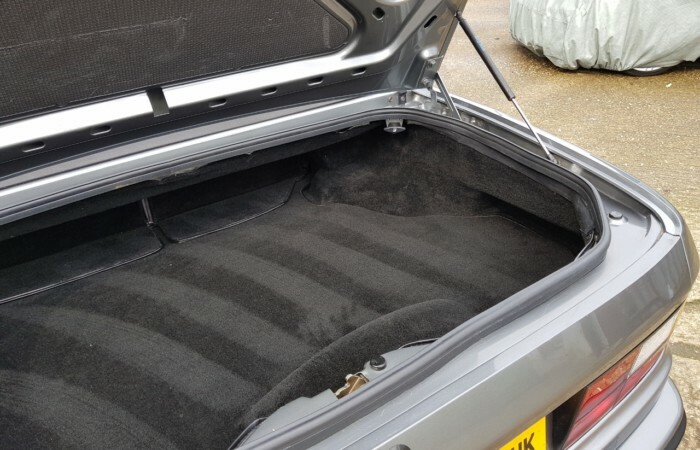 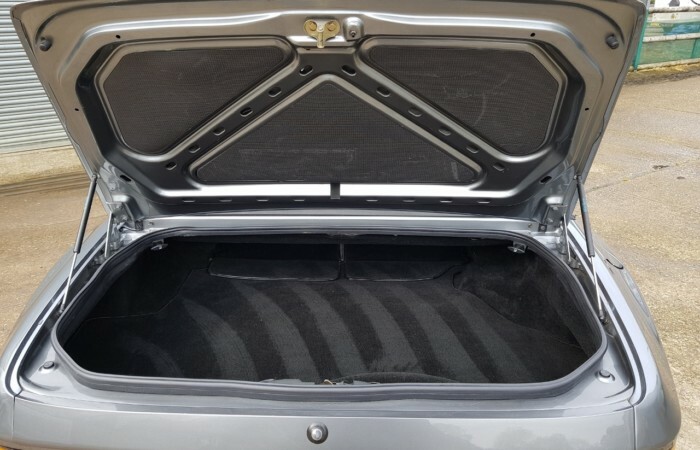 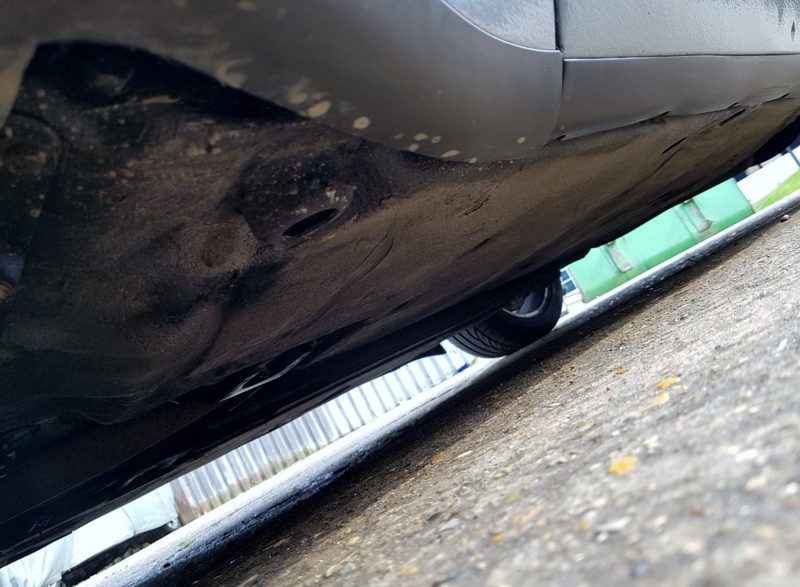 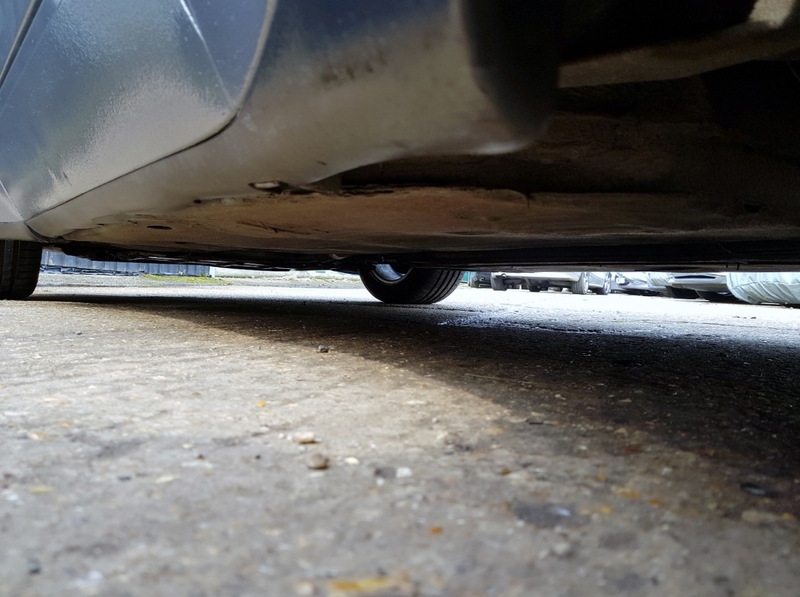 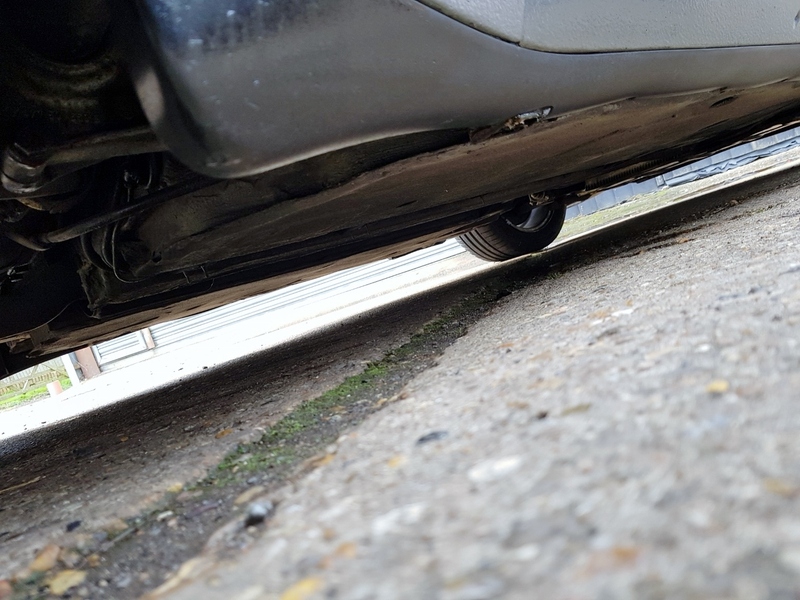 The space saver spare is in the boot. On this example it benefits from an electric roof. 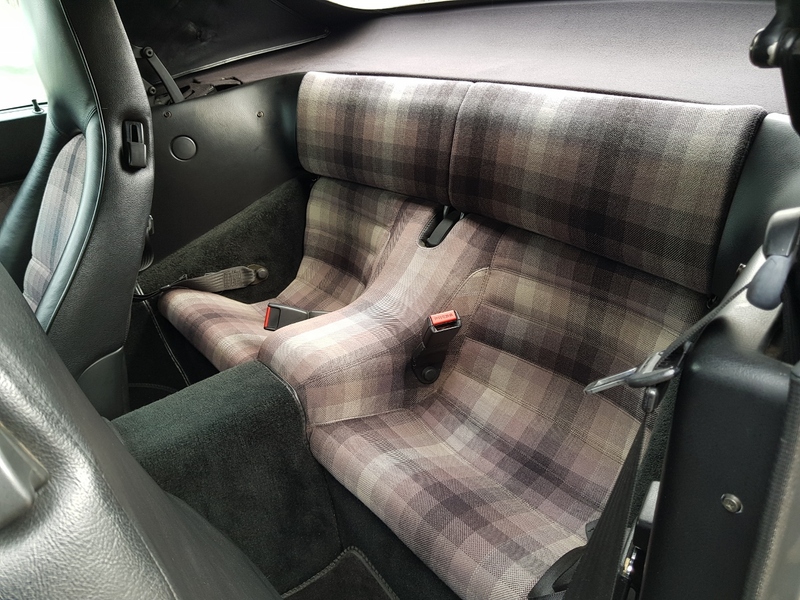 This is so simple to use and feels strong and well designed. 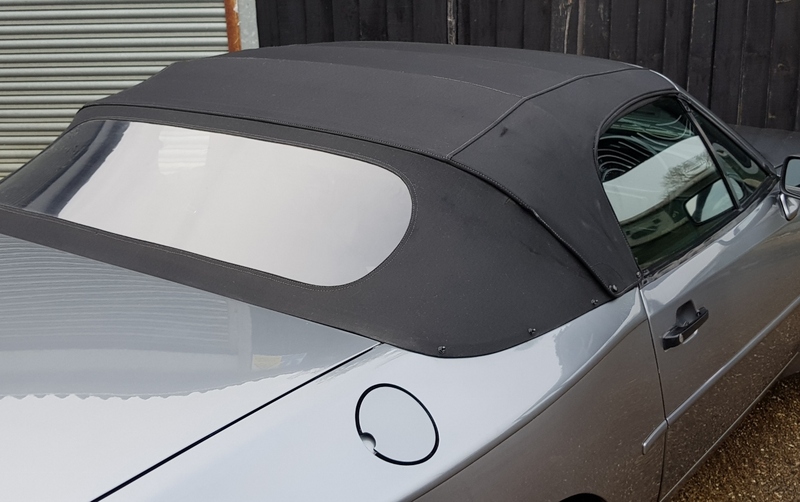 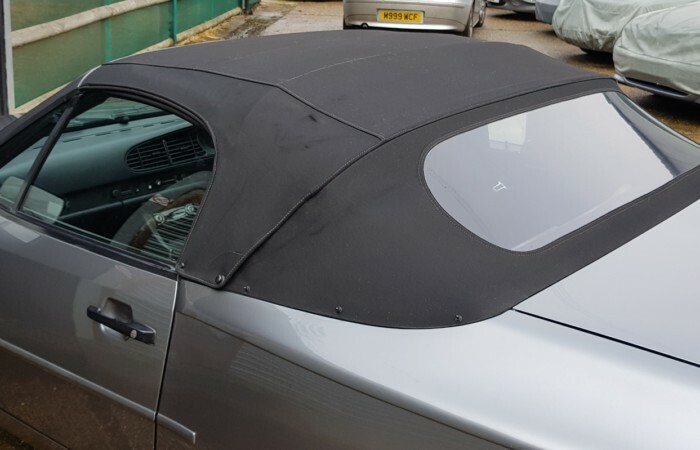 This condition of the roof is excellent, clear rear screen etc. 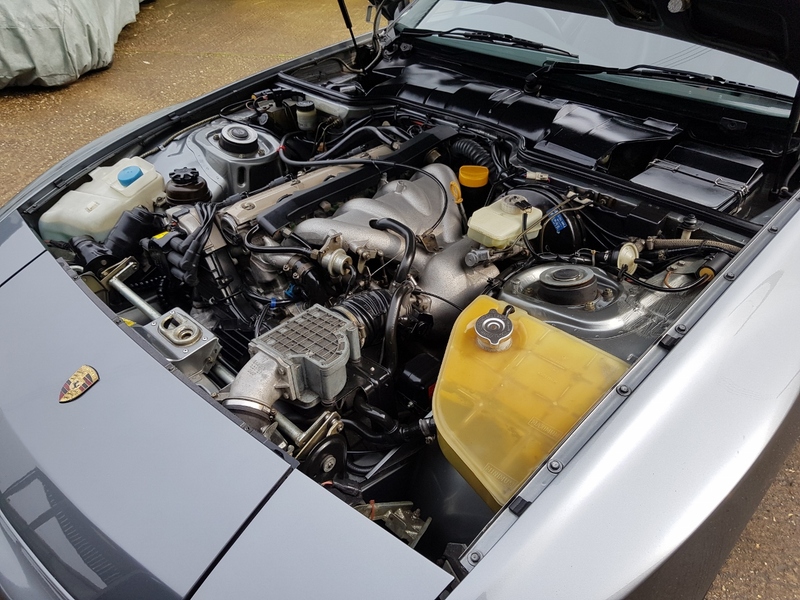 This example features the 3.0 engine, producing around 210 BHP, propelling this car to 60 in around 6.5 seconds, with a top speed of 150 mph. 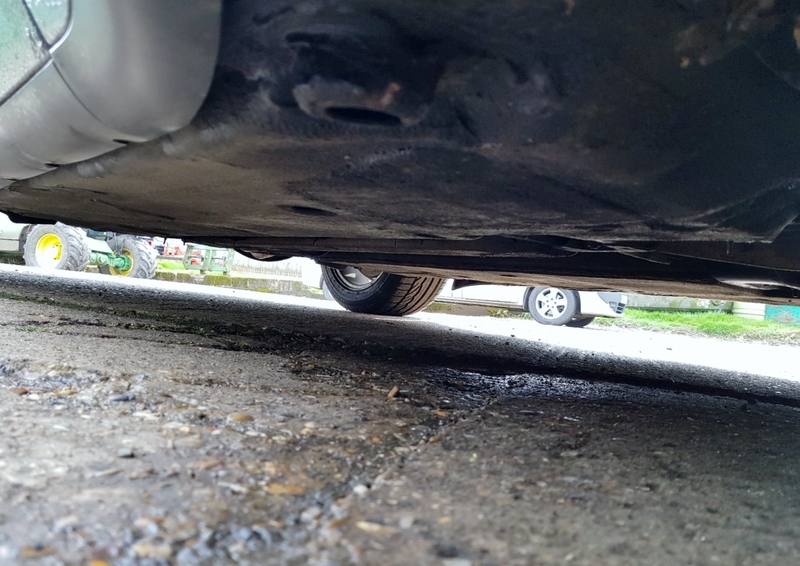 The engine is super smooth has ample torque. 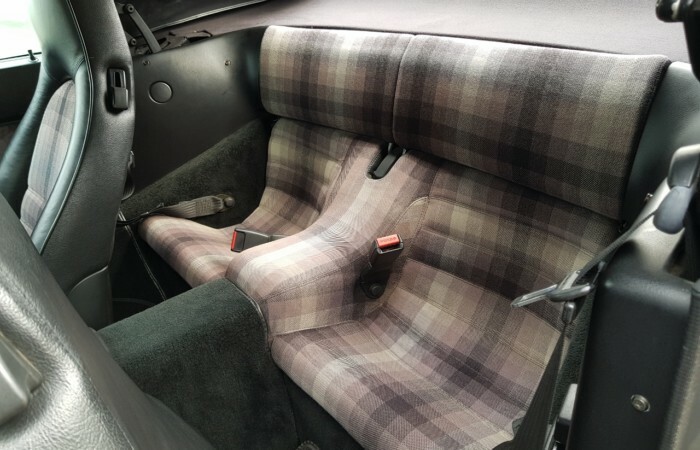 This car will pick up speed very quickly, no fuss. 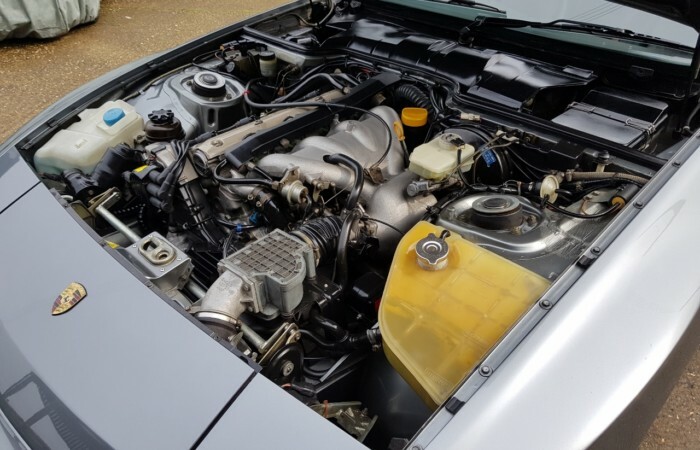 The 5-speed manual gearbox was revised to suit this later engine. 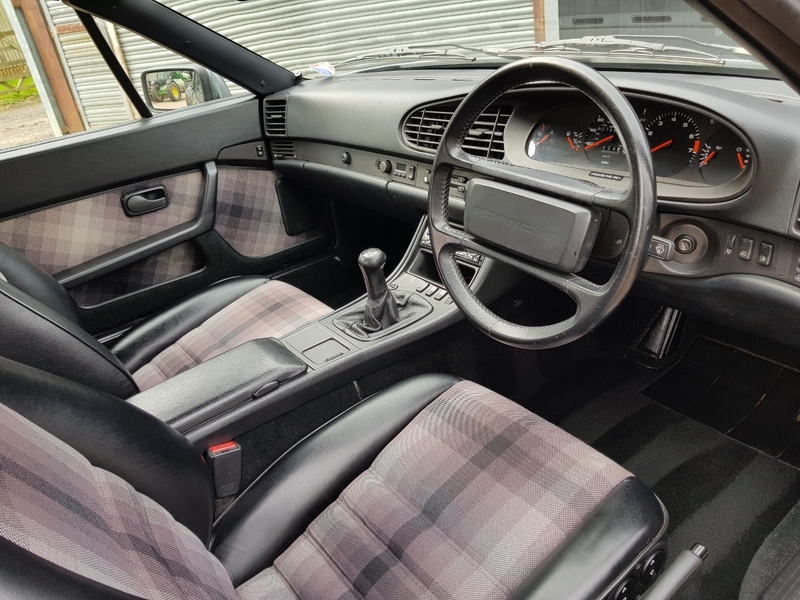 It’s got a lovely short shift feel and reassuringly tight feel. 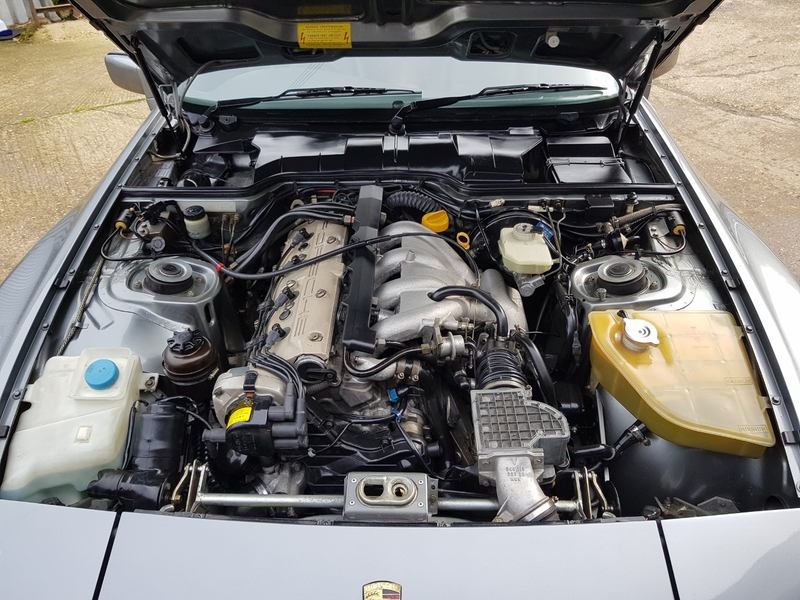 When you examine this lovely engine bay, it’s hard to imagine it was produced in 1991. 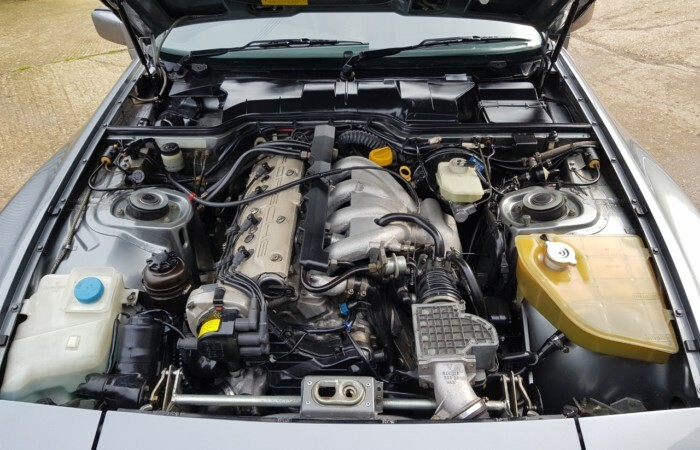 Its such a clean example, the engine bay is as clean as the rest of the car. Look at the engine cover, just as it left the factory. 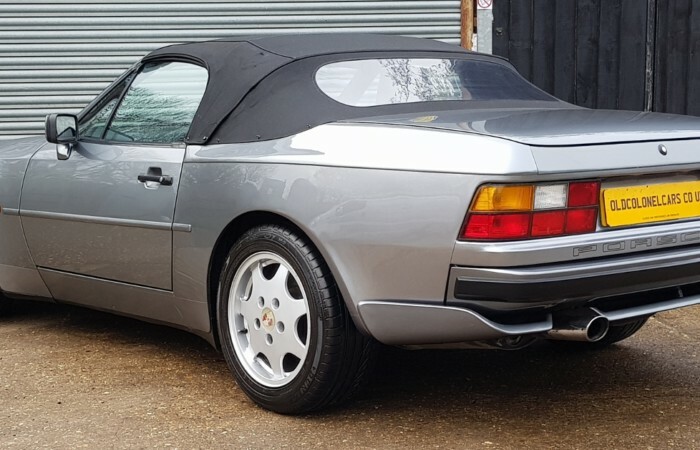 This Porsche benefits from an excellent, full service history. We have all the original manuals, a fully stamped original service book, both keys and both Porsche immobilisers, a folder full of service receipts and all old MOT’s, HPI clear certificate etc. 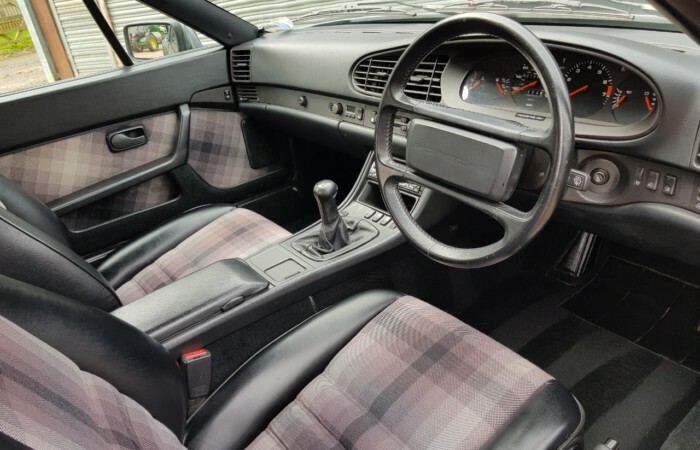 Everything is up to date on this car. 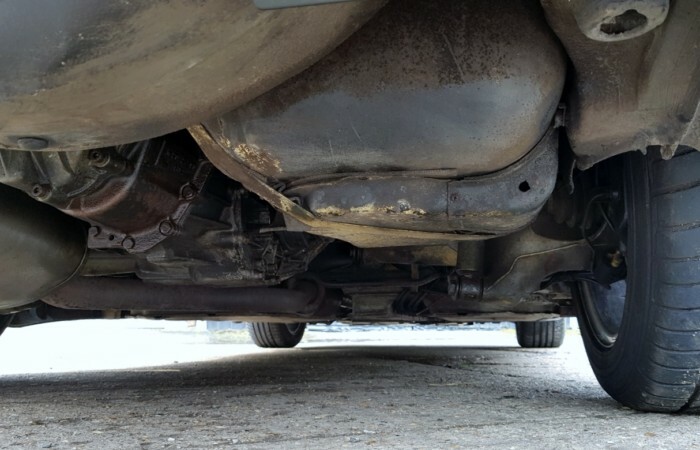 It just has a full service and timing belt replacement. 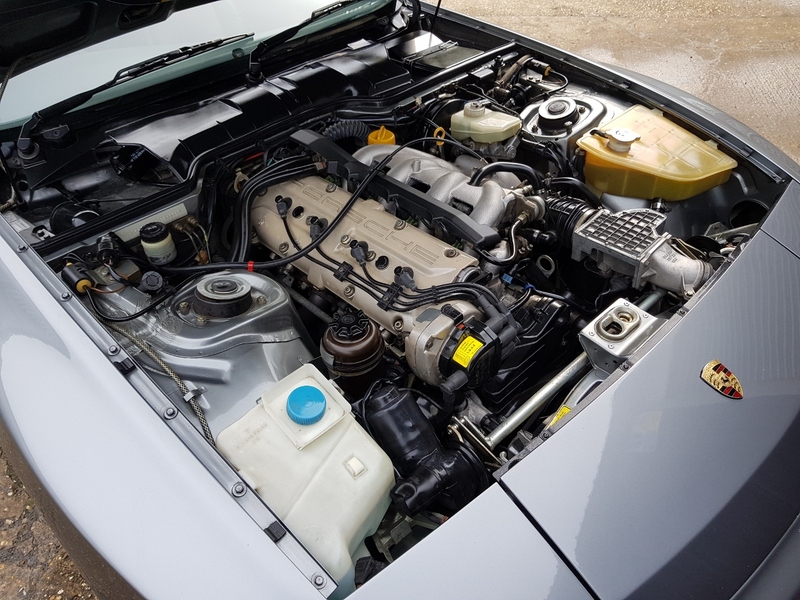 To give you an idea of the maintenance on this car, the last 2 timing belt replacements happened at 71,000 and just now at 74,000. 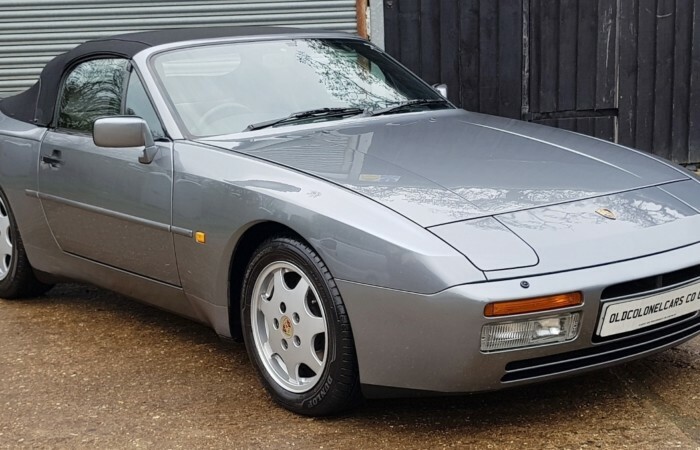 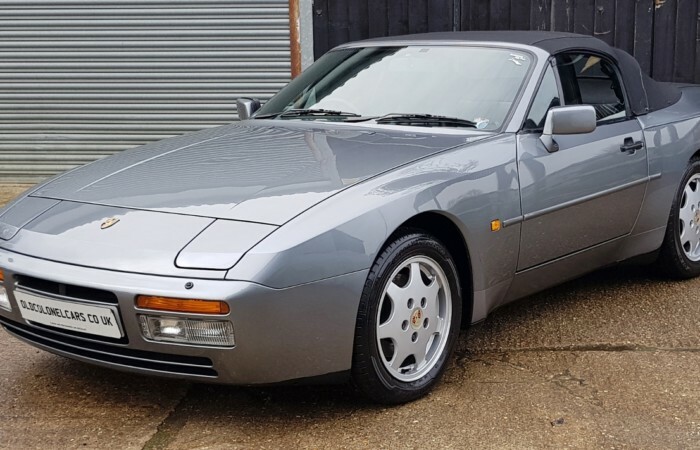 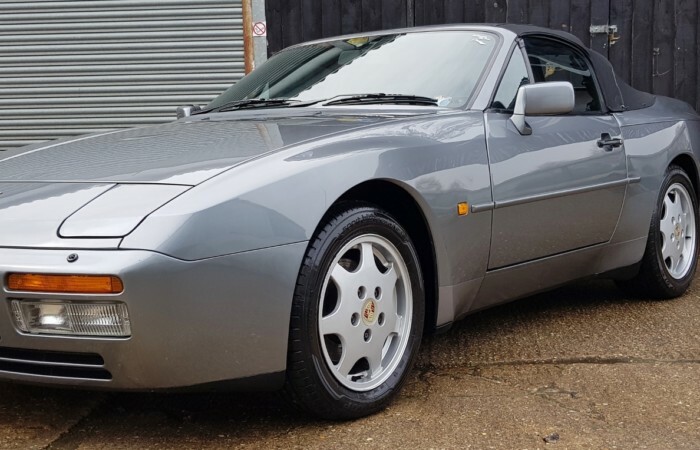 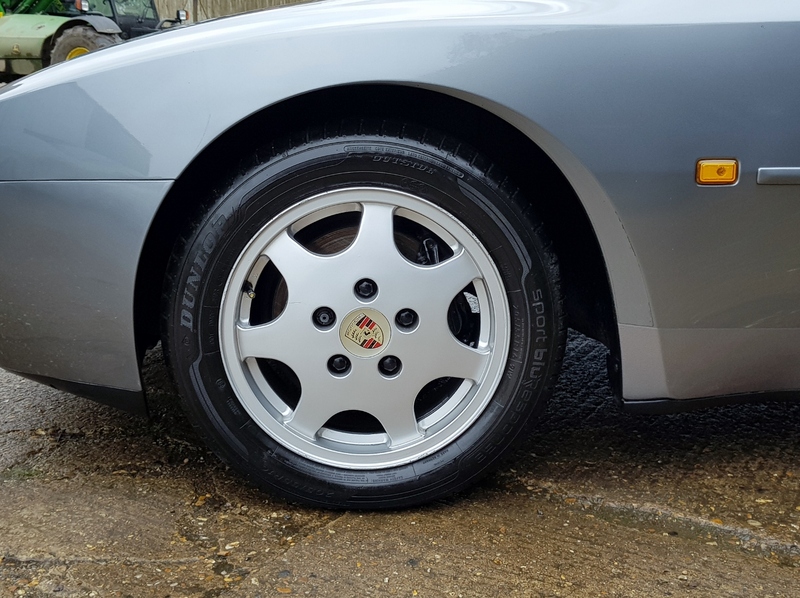 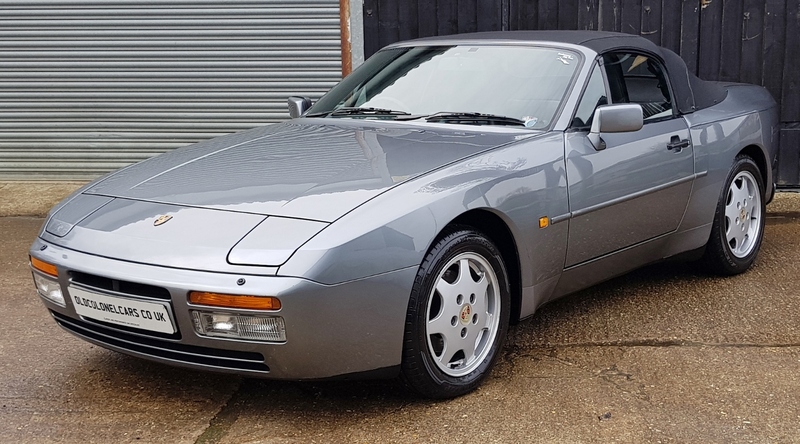 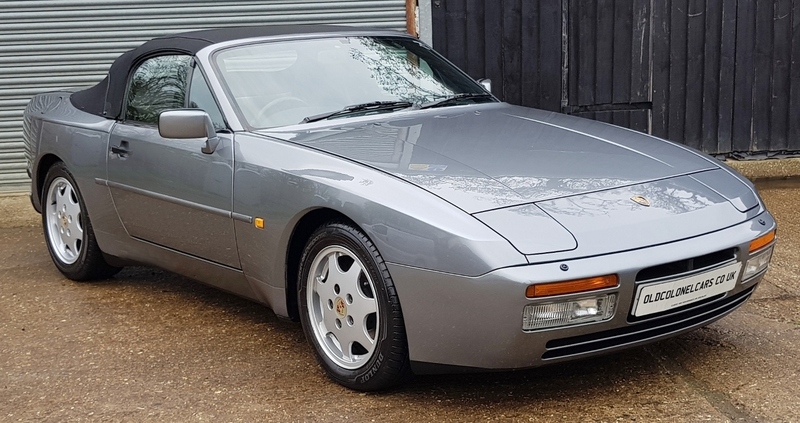 Porsche 944’s prices are on the rise, particularly very low mileage, low owner examples like this one. 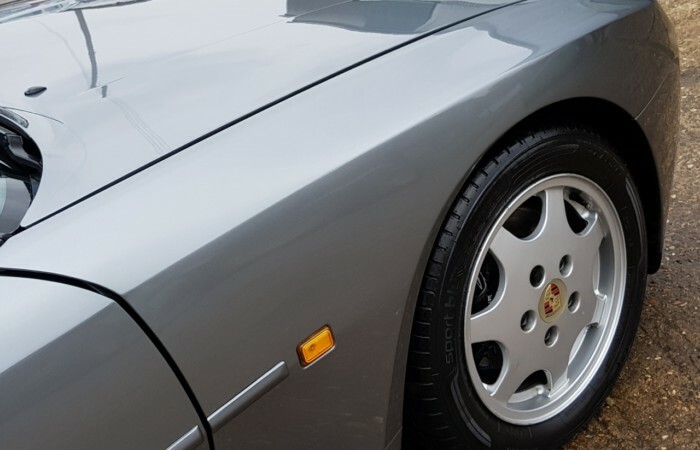 When buying a classic Porsche, the service history must be right. 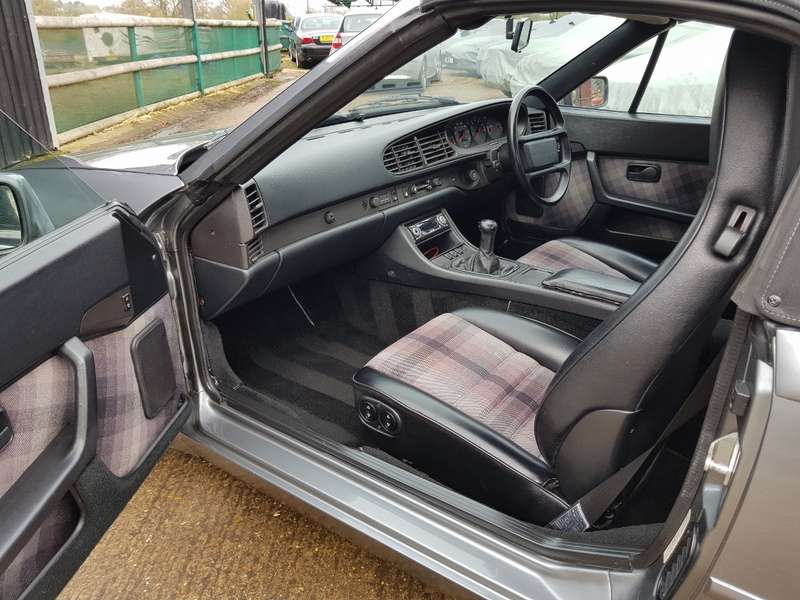 Well you won’t find a better maintained example than this one. 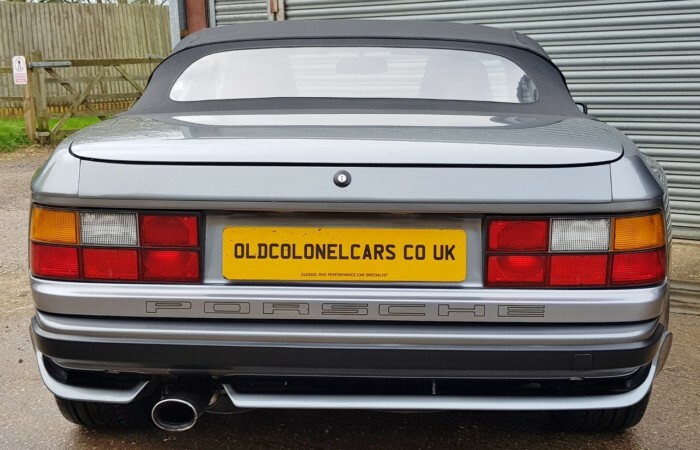 Finished in a lovely colour combination, this example will make a fantastic classic purchase. 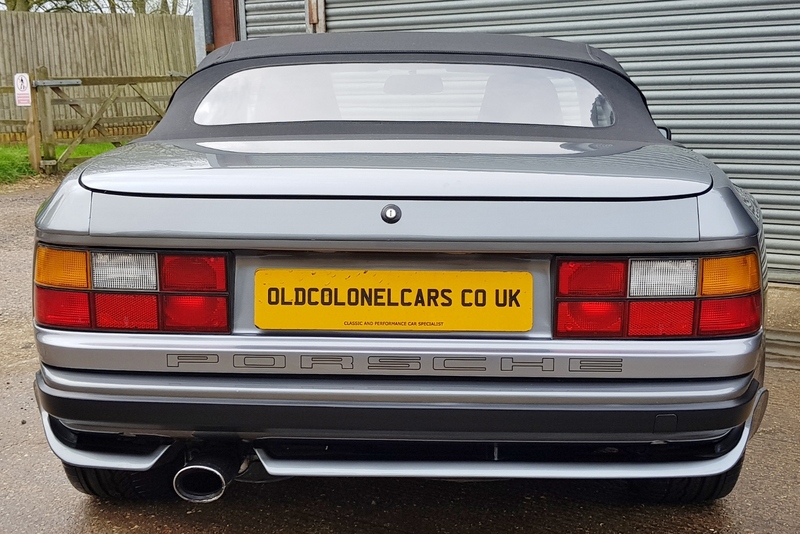 It just had an MOT and is ready to be enjoyed now.